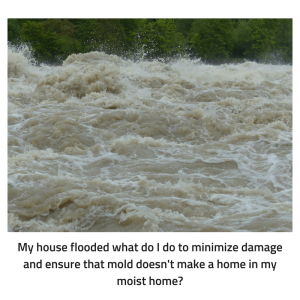 My house flooded what do I do to minimize damage and ensure that mold doesn’t make a home in my moist home? Water damage, whether from a natural disaster or even plumbing issues can ruin your floors, walls, and ceilings of your home. After a flood occurs in your home, time becomes of the essence as the longer water sits on the surfaces of your home, the quicker mold will begin to become an issue, along with a number of issues such as odors, permanent damage, and even potential structural damage. Unfortunately, 14,000 people experience water damage at home or work each day. And in recent news, the devastating floods in Montana – the Clark Fork River in Missoula receded by over two feet, with a high of 13.82 feet, the highest crest since 1908 – have created major problems for those whose homes have been affected by this natural disaster. 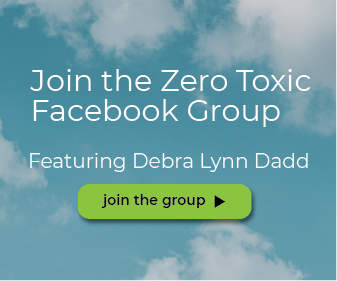 When you are faced with flooding in your home acting quickly and following the right steps can save your home from complete destruction and most importantly toxic mold growth. 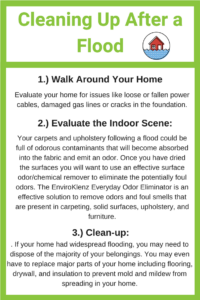 If you want to learn about mold symptoms in your home, check out our article in detail. What to do After a Flood in Your House? The first thing to do after a flood occurs in your home is to turn off the electricity. Water and electricity equal issues, and potentially deadly hazards to those exposed. After you have ensured that the electricity is off you are than left to deal with the damage in your home. In many cases, wood in your home has been submerged in water and has likely absorbed a large amount of water, which can lead to continuing problems such as mold growth, insect infestation, and deterioration of the wood. Also, your furnishings and carpets will likely need to be removed to the outdoors to be cleaned, dried, or in some cases discarded after absorbing flood water. When your carpets and rugs have been submerged in flood water, it is best to toss them in the waste due to the contaminants that are composed of flood water that then get trapped into the fabric of these flooring. The next step is to make sure to also dry off the subfloor thoroughly and as quickly as possible following a flood. The potential for mold to grow will progress on the carpeting of your home when it is left wet or damp for a long period after the encounter with water. Thus, you will be left dealing with the much larger issue of combating mold in carpet caused by the water damage. 1.) Walk Around Your Home: Evaluate your home for issues like loose or fallen power cables, damaged gas lines or cracks in the foundation. 2.) Evaluate the Indoor Scene: Severe water damage in many cases will require a professional – with heavy-duty equipment to remove water from the environment. When you are left dealing with damage to your walls and/or floors you will want a professional to handle the job to ensure that it is completely and safely rectified. However, if the damage is minimal you can try to mitigate the problem yourself. 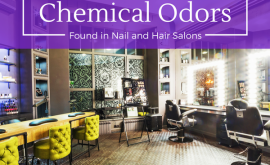 Your carpets and upholstery following a flood could be full of odorous contaminants that will become absorbed into the fabric and emit an odor. Once you have dried the surfaces you will want to use an effective surface odor/chemical remover to eliminate the potentially foul odors. 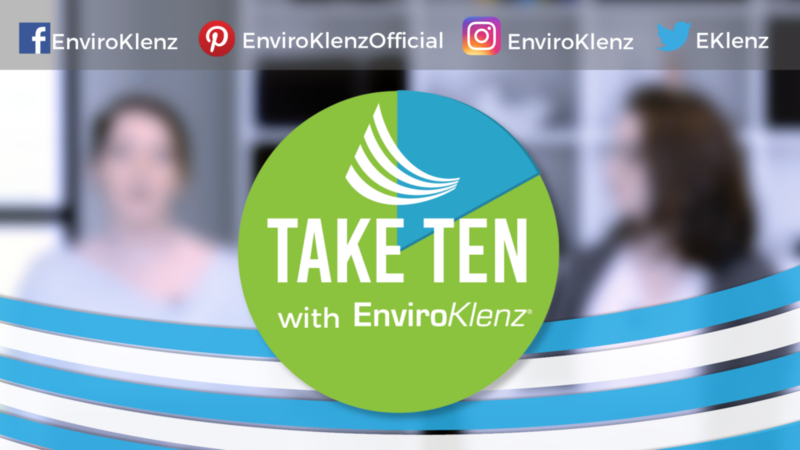 The EnviroKlenz Everyday Odor Eliminator is an effective solution to remove odors and foul smells that are present in carpeting, solid surfaces, upholstery, and furniture. 3.) Clean-up: When going through the process of cleaning up after a flood, the main determination is whether items in your home are salvageable or they need to be tossed. If your home had widespread flooding, you may need to dispose of the majority of your belongings. You may even have to replace major parts of your home including flooring, drywall, and insulation to prevent mold and mildew from spreading in your home. 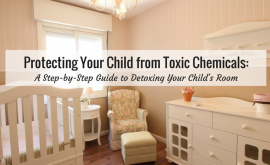 The reality is, it doesn’t take much for mold to grow and do a lot of harm. And, unfortunately, floods present the perfect environment for mold to grow and thrive. The ideal conditions for mold to grow to include a little or a lot of moisture, and a dark environment to ignite the rapid growth. So, if your household experiences both flooding and power outages from spring to the summer months you are a prime candidate for mold growth in your home. The question then becomes, how fast does mold grow after a water leak or flood? The quicker you start cleaning up after a flood or water damage, the sooner you can stop mold in its tracks from growing. Mold typically begins to grow within 24 to 48 hours, which means you need to quickly act and dry the environment to prohibit potential mold growth in your flooded home. Sometimes, though, you can’t beat the growth of mold after water damage or a flood occurs. If mold does develop in your home you may want to be on the lookout for symptoms that could include throat irritation, wheezing, coughing, asthma attacks, and lower respiratory infections. After a flood in your home, there are several steps to take to prevent mold from growing in the moist environment. First, you want to remove wet items from your home, this could include pillows, upholstered furniture, curtains, and any other fabrics in your home. Next, you will want to use a shop vac or wet vac to absorb the water out of the moist carpets. You may also need to rent/buy a dehumidifier to help with moisture levels in the air. The main goal is to get as much air moving as possible, especially if mold has started growing, as mold spores will spread through the air. 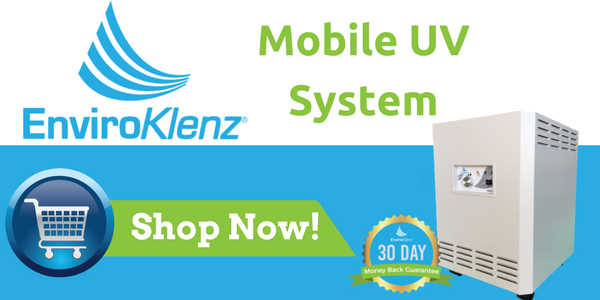 The EnviroKlenz Mobile UV System utilizes ultraviolet germicidal radiation (UVC) to effectively kill microorganisms (such as bacteria, viruses, and mold spores) collected through the air system. This also goes through a two-stage filtration process with the first stage combating VOCs, noxious odors, and a broad spectrum of chemicals with our patented earth mineral technology VOC Air Cartridge, and the second stage a hospital-grade HEPA filter that removes particulate matter up to 0.3 microns in size. 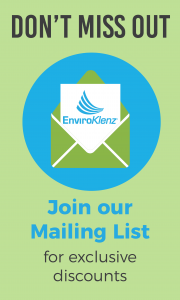 The EnviroKlenz Mobile UV System offers indoor air protection from potentially harmful mold spores that could be in your home’s air; it is one of the best air purifiers for mold and mildew issues. Do you have mold in your home? 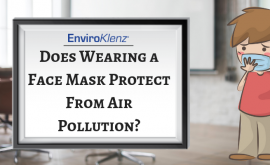 The EnviroKlenz UV System can help! This system utilizes Ultraviolet Germicidal Radiation (UVC lights) to trap and kill mold spores that are in your indoor air. 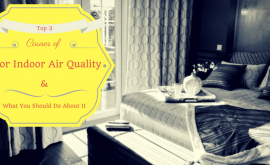 Breathe easier with this air purification system in your home! ✓Two-Stage Filtration, With Patented Technology & a Certified Hospital-Grade HEPA Filter for Ultimate Protection! ✓Air Cartridge That Works to Eliminate a Broad Spectrum of Chemicals & Odors- With Up to a 6 Month Life!